Dr. Rock's Blog & Roll: Album of the Day: Allman Brothers (2/12/72) 38 Years! Album of the Day: Allman Brothers (2/12/72) 38 Years! 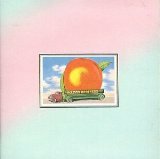 The band’s tribute to departed brother Duane, the Allman Brothers released Eat A Peach on February 12, 1972. Duane had died in a collision between his motorcycle and a flatbed lumber truck (not a peach truck as commonly thought) on October 29, 1971, and the double album included a mixture of studio tracks recorded before his death, live cuts from the Fillmore concerts in early 1971 that were not included on the terrific Live At The Fillmore collection from July 1971, and a handful of new songs completed in the studio by the band in the weeks following the accident. (For a 25 song playlist of the best of the Allman Brothers, visit Dr. Rock’s Playlist Vault here). By mixing live jams and studio tracks, Eat A Peach creates the quintessential Allman Brothers Band collection. From boogie-rock (“One Way Out”) to jazz-rock instrumental interplay (“Les Brers In A Minor”) to inspirational piano-guitar rock (“Blue Sky”) to plaintive folk-rock (“Melissa”) to acoustic simplicity (“Little Martha”), the album highlights the exceptional range and capabilities of the ABB as a tight-playing group and as individual artists. Duane’s slide guitar virtuosity is showcased on “Mountain Jam,” a 2-side, 33-plus minute rendition of the ABB’s take on Donovan’s “First There Is A Mountain.” Although it’s quite long for casual fans of the band, it’s a great track that’s even better when compared to the less polished version the band released in 1991 on the Live At Ludlow Garage 1970 retrospective CD. Eat A Peach is one of my favorites and is available for purchase as a CD or download as mp3 files on Amazon (click here) or as iPod downloads at iTunes (click here).